The High Court decision to reject a judicial review in the Isle of Wight is a worrying one, principally because it may give councils, almost literally, a “get out of jail free” card. Judge Pearl said that it needed to be borne in mind that the council was facing “difficult circumstances”. This, to the layman’s ears, is an extraordinarily broad statement that could mean any council could break the law and, as long as it could show it was under some stress at the time (“The Chancellor Forced Me To Do It” perhaps) then it would not be punished for doing so. Almost as worryingly, the delays caused by the Legal Services Commissions (although one needs to say that the LSC refutes this) over whether it would fund the prosecution has been used in favour of the defendant. So, one law for the rich then…. another law for the library campaigner. Finally, it is worrying because English law is not based on what is fair but on what is precedent – and this case may set a precedent. Worrying if one lives in any authority facing serious cuts in it s budget and if one relies on the LSC and/or does not have large amounts of money readily to hand to instantly pay for solicitors. That is, worrying for all of us. 407 libraries (329 buildings and 78 mobiles) currently under threat or closed/left council control since 1/4/11 out of c.4612 in the UK, complete list below. Librarian professional body CILIP forecasts 600 libraries under threat (inc. 20% of English libraries). The Public Libraries News figure is obtained from counting up all reports about public libraries in the media each day. Library marketing and promotion – #uklibchat. The results of a brainstorming session amongst interested parties on Twitter. Excellent ideas for the professional and for the campaigner too. “The factor deciding who councillors will listen to is not the quality of the advice, but the offer of money. For this reason the Arts Council has been very successful in persuading local councils to support initiatives—ranging from the Cultural Olympiad to increasing the number of people actively engaged in the arts.” John Pateman, BookSeller. Money talks – BookSeller. John Pateman notes that, unlike the Arts Council (see above quote) the DCMS advice on libraries was ignored by councils due to it (a) employing rather than specialist librarians and (b) councils feel it lacks teeth. CILIP advice ignored as seen as self-interested. MLA ignored because it “looked and sounded like something produced by a committee, with no clear remit or focus”. New York City Libraries: Providing education and titillation – Concerned Women for America. Another amazingly over-the-top article from the USA, including the lines “In New York City Public Libraries, policies are evidently put in place for the perverts.”. Save Troy Library: The sisters interview TPL Director Cathy Russ – Books for Walls (USA). Nice interview with the library manager and interesting ideas about how to campaign, although not all transferrable to the UK. Blackpool – No libraries closing (previously listed as 2) Mereside Library has reduced hours, new library at Moorpark. Hackney – Pledge to increase library opening hours. Manchester – 4 libraries and at least 2 mobiles under threat (previously down as 5 libraries) – 3 to close (Clayton and Rack House entirely, East City to be only for Manchester College Students) as part of £3m cut. At least 2 mobiles to close. Opening hours to reduce. Hulme Library to move into Moss Side Leisure Centre. Barlow Moor Library may depend on volunteers to run it in 2012. York – Free wi-fi and self-service in all libraries by end of 2011. “As one of the Councillors for one of the wards (Enfield Lock) Mr de Bois represents I wish to reassure Enfield residents, and members of the wider public, that no decision has been taken to close any library in the areas Mr de Bois suggests. DigitialDemocracy members et al should understand what Mr de Bois does not tell his constituents, and members of the wider public is that Enfield Council, which is currently run by Labour, has received £8 million pounds more in cuts compared to wealthier boroughs such as Richmond-upon-Thames and Kingston. Mr de Bois may lay claim to standing up for people of Enfield North -or should I say being an Enfield MP in Westminster and not a Westminster MP in Enfield. Well, now is the time for Mr de Bois to stand up and be counted and oppose the what his government is doing to Enfield. If any cuts to have to be made it will be down to the unfair allocation of funds to Enfield Council by the government, and if all three libraries survive it will not be down to Mr de Bois, it will be done to the ingenuity of Labour Councillors and Council officers fighting a hidden agenda by Mr de Bois and his government to ru systemactically weaken public services to make the case easier for corporations to move in to take control not just of libraries but all public services.” Enfield – Cllr Ozzie Uzoanya, post in Digital Democracy. Hackney – Union wins council rethink over hackney libraries cuts – Hackney Citizen. Decision “followed a protest on the steps of the Town Hall at which staff waved placards condemning staff cuts and what they called the “slow death” of the libraries service.”. Pledge to increase opening hours. Isle of Wight – High Court libraries hearing: judicial review rejected – Ventnor Blog. Rejected due to (a) delays caused by Legal Services Commission, (b) the Council was facing “difficult circumstances”, (c) Council had gone into process with an “open mind”, and (d) Equalities legislation was given due regard. “The defendant (IWC) has applied for costs of the acknowledgement of service and cost of attendance today. One of the library campaigners, Dave Quigley, said after the decision, “We are holding the Legal Services Commission responsible for this due to their delays.”. Isle of Wight denied library closures review – BookSeller. LSC does not accept the blame. End of the road for library cuts campaigners – Isle of Wight Radio. Council says “”This decision means that we can focus all our efforts on helping support those community groups who are working so hard to establish community libraries. We have recently extended the time available to these groups to finalise their proposals as a sign of our commitment to maintaining an excellent library provision on the Island.”. Library cuts challenge blocked – Independent. Campaigner says “even if the libraries were transferred to community groups, their future remained uncertain and they were in danger of failing through lack of funding or suitable volunteers to make them a success.”. Campaigners lose fight against libraries’ closures – IWCP. Isle of Wight legal challenge blocked – BBC. Lambeth – Doctor’s at the library? – South London Press. “Suggestions from Lambeth’s libraries commission include putting old books in police station waiting rooms, raising late return fines and running doctors’ surgeries from public libraries.”. Suggestions also include room hire increases, higher DVD charges, coffee shops. Oxfordshire – Library cut plans “are based on biased data” – Henley Standard. “More than 310 residents attended a public meeting on Monday to discuss the proposed changes to the facility in High Street. Under plans announced by Oxfordshire County Council, two-thirds of staff funding could be withdrawn so volunteers would be needed to maintain the current opening hours.” Statistics used by council were taken while in temporary building during £700,000 improvement of permanent library. Sandwell – Furious librarians send Sandwell Council a red letter over industrial action – Halesowen News. Sandwell wants to replace library staff with volunteers. “UNISON has announced from August 1 the normally mild-mannered librarians will be working to rule and refusing to carry out anything but the most basic of their duties. The ballot, which 87 per cent of members took part in, resulted in a massive 97.5 per cent voted for action after learning of Sandwell Council’s cost cutting plan.”. Comment apparently from chief librarian suggests that strike is, rather, about a regrading dispute. 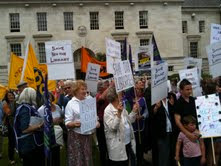 “Biggest demo” over Surrey library cuts – BBC. “The demonstration by library campaigners and the public sector union Unison is due to take place outside a cabinet meeting on Tuesday.” Each branch is aiming to send at least ten people, the WI are also involved. Council wants to force local communities to run 11 libraries or see them close. Leader’s views on libraries – Surrey Council. Dr Povey likes volunteers replacing paid staff. York – Free wi-fi boost for York Libraries – Press. Self-service and Free wi-fi for all 14 libraries by end of 2011. Print article This entry was posted by Ian Anstice on July 26, 2011 at 9:46 pm, and is filed under Uncategorized. Follow any responses to this post through RSS 2.0. You can skip to the end and leave a response. Pinging is currently not allowed. Talk about the Establishment looking after its own, at our expense. It seems our politicians can afford to spend millions of pounds a week interfering in the internal affairs of other nations and causing death and destruction on an horrific scale, but don’t want to afford the small sums required for the educational and cultural facilities which Public Libraries provide to our own community. Disgraceful and extremely sad.